POTD: You can never go wrong with one stunning photo per day! Especially when it’s an underwater oasis. Silly Mind Tricks: Spoiler alert! I thought of broccoli. Hope that doesn’t ruin it for you. Snowflake What?! : I don’t believe this. This is not possible. Ok, maybe it is. But I have my doubts. Is this a hoax? Popular Mechanics: Slash that utility bill! SLASH IT! A list of 19 ways to stop spending money on useless stuff. Adam Savage’s Obsessions: TED gives us another great talk on a fascinating person. 15 minutes long, but really, really cool. I was browsing Wired Magazine this morning and found a really cool article by Erin Biba about some new uses for “retired” underground mines or caverns. If you have 10 minutes, check it out here. It’s an amazing picture gallery with brief explanations. It’s really interesting to hear about these places – I thought they only existed in movies! I guess for some organizations (like Wikileaks), security, safety, and relative obscurity from the public are top priorities. If you had beaucoup bucks to squirrel stuff away inside a secret underground facility, what would you keep there? Personally I don’t own anything that requires protection from potential nuclear fallout, so instead, I guess I’d want an emergency underground bunker in the event that nuclear fallout does happen. I’d kit it out with all the essentials – tons of nonperishable food, some kind of perpetual motion geothermal heating and cooling system, enough beds and couches for me and all my friends, a swimming pool and hot tub…I could go on and on. But really, what would you guys do with an empty, secure, underground cavern? Remember, money is no object in this hypothetical situation! Here’s a news report on Iron Mountain by KOMO 4 News, a local station out of Seattle, Washington. 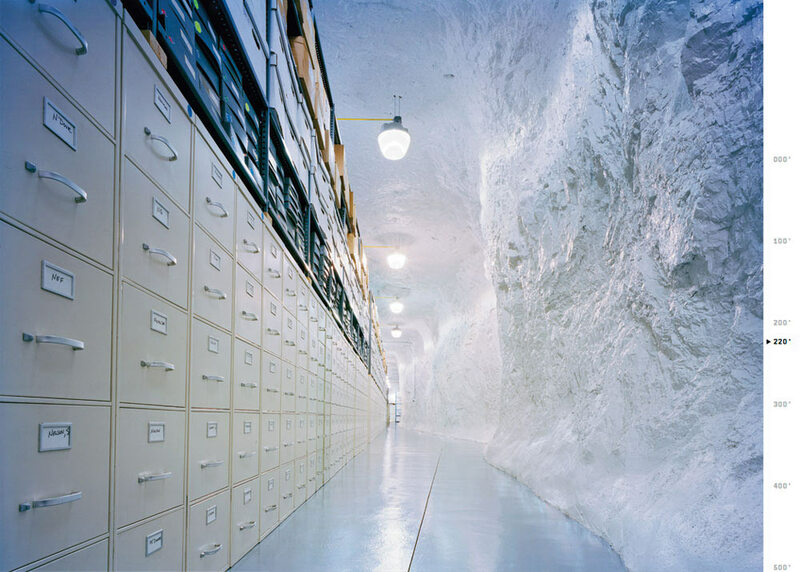 The reporter takes her viewers inside the mountain for an intriguing look at what’s being stored underground, and why. Good morning, LB. Are you at work yet? Great! Here are some links for you to check out once you fill out that TPS report. An Internet Timeline – This is just funny, and also useful for you people under 18. The Good Guide – Ever wondered how your shampoo scientifically & environmentally ranks against other shampoos? Well now you can find out! You Grow Girl – For the resourceful and humble gardener with little gardening space and even less money. The Dangerous Sports Club – Pretty much explains itself. Energy Fiend – So you really think you can drink that much Vanilla Coke and survive, huh? How much hot cocoa do you think it would take to keel you over? Meaning: A new or inexperienced surfer. Shark attacks happen pretty frequently in the cold current waters around Australia. To a Great White, surfers or body boarders are bite-sized! That’s why wetsuits come in an array of neon danger colors like Tennessee orange, lime green, and electric blue. South of Adelaide, where I’m from, there’s a sleepy coastal town called Victor Harbor. Part of the shoreline is a steep and rocky cliff line, and the Southern Ocean is merciless when the currents are coming in. Translate: It’s perfect for morning surf sessions. My mates Tom and Chris would go surfing there every weekend. I went up there with them once to try it out, but I was too terrified of getting bit by a shark to get in the water. Yeah, I’m a real go-getter.